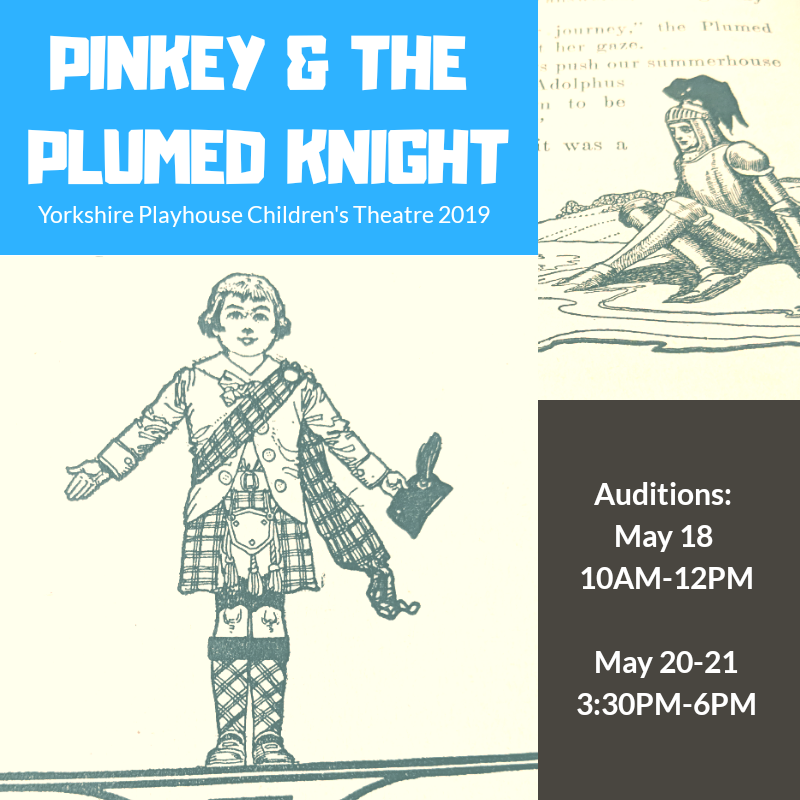 I would like to invite your child to audition for the summer 2019 Yorkshire Playhouse Children's Theatre production of Pinkey and the Plumed Knight. Pinkey and the Plumed Knight is adapted from the classic children’s book by Frederic Chapin. The story revolves around a little Scottish boy named Donald McGregor, better known as Pinkey (so named for his red hair). He accidentally spills the magic powder from an antique box and brings to life a suit of armor containing the Plumed Knight. The two become friends and set out on a journey to Egypt with a talking pig. Along the way, they are joined by a barber and a sailor and encounter whales, mermaids, Razmataz the Arabian Chieftain and the lovely Princess Lotus before Pinkey eventually finds his way home. Yorkshire Playhouse Children's Theatre is for children who have completed first grade to those who have completed their junior year in high-school. The aim of the Yorkshire Playhouse Children's Theatre is to teach children about theatre, performance skills, and to give the children of York County an enjoyable artistic experience. Rehearsals will begin on Monday, May 28 and run through the month of June, beginning each weekday morning at 8:30 a.m. and going until 11:30 a.m. The performances are schedule for June 20, 21, and 22 at 7:00 p.m., and June 23 at 2:00 p.m. There are roughly 40-50 parts in Pinkey and the Plumed Knight. Auditions will be held at the Yorkshire Playhouse on Saturday May 18 10:00-12:00 pm, Monday May 20 & Tuesday May 21 3:30-6:00. Please arrive 15-minutes before your scheduled audition time to fill out an audition form. Please know your actor’s schedule for the show’s rehearsal time ahead of auditions so all conflicts can be noted on the audition form. It is recommended that you schedule an audition at yorkshireplayhouse.com/events-master/auditions-ypct2019 or by emailing yorktheater@gmail.com. When emailing, please include your name, your phone number, your child's name, the grade your child will be entering in the fall, and the times they are available to audition. An audition time can be reserved by calling the Yorkshire Playhouse at 402-362-7060 on May 9 or 10, 3-5:30 pm. Our volunteer run box-office will only be reserving audition dates by phone during the times listed, calls made before this time will be directed to yorkshireplayhouse.com. Walk-in auditions are welcome, however if you show up at the door without a reserved time your child will be given the nearest time available. Unfortunately, not all children who audition can be selected for the production. Please prepare your children for the possibility of not making the production after auditioning. Those who make the production are expected to be at all rehearsals, and ready to work on the show. Theatre is team art. Every cast member is important, and without complete cast commitment, the final production suffers. Each participant in The Yorkshire Playhouse Children's Theatre must pay a joining fee of $45.00 to be in the production. The fee includes the production script, production T-shirt and two tickets for the production. Fees are only paid by those who make the production. Scholarships are available for families who cannot afford the fees. I hope to see you at the auditions!